As vice president for programs, Barb is responsible for providing oversight for all of the Foundation grant programs. She works with the Foundation's Board of Trustees, Grant Committee and staff to develop and implement initiatives aimed at raising the quality of life for DuPage residents. She is also responsible for building and maintaining effective partnerships with the community's not-for-profits and she works closely with Foundation donor-advisors in an effort to connect them to organizations and programs that align with their philanthropic interests. 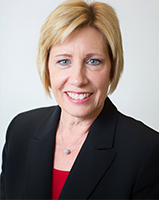 Prior to joining the Foundation eight years ago, Barb served as executive director of the Elmhurst School District 205 Foundation for Educational Excellence for 11 years. There she managed the Foundation's grants program and worked collaboratively with its Program Committee, Board and others to accomplish the Foundation's development and grantmaking activities, increase its visibility throughout Elmhurst, foster strategic partnerships and ensure its overall success. In addition to her not-for-profit background, Barb possesses several years of experience in the human resources field. She holds a Bachelor of Science degree in Speech Communications and a minor in Public Relations from Illinois State University. Barb is a life-long resident of DuPage County, and currently lives in Elmhurst with her husband, George, and their three children. Barb serves on several county-wide boards including the DuPage Federation on Human Services Reform, DuPage Homeless Continuum of Care as a member of the Leadership and Grants Funding committees, DuPage Workforce Investment Board, and Impact DuPage as a member of the Steering Committee. Barb is the recipient of the 2012 West Suburban Philanthropic Network Grantmaker of the Year Award and Suburban Life Magazine’s 2016 Woman of Distinction Award.